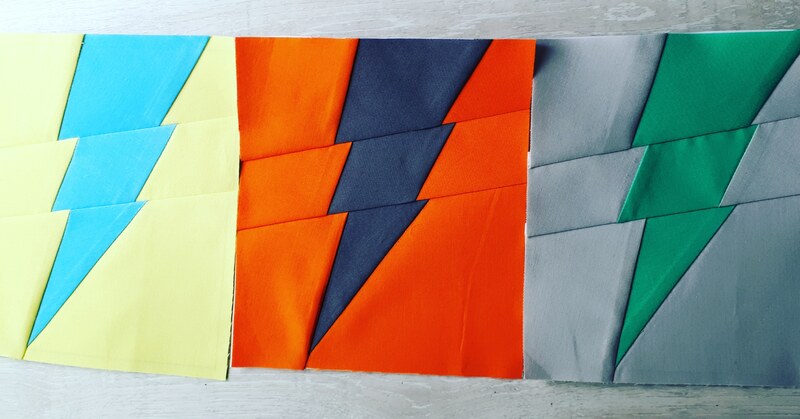 Get out your solids for this month’s striking block lotto challenge: LIGHTNING BOLTS! My flash of inspiration came from Amy’s improv challenge prompt of the Sea-to-Sky Hwy with the zigzagging road and the forest (fires) led my imagination to nature’s fire works. As this is the modern quilt quild, we are going to go a little glam rock with them in bright solids in whatever colours light up your brain. Made by Niki Storr based on free pattern by Crafter Without a Cat. Please add a quarter inch seam allowance, if you trim, and keep the paper on for stability. A reminder that for every block submitted to the block lotto you get a chance to win all of them!